TOYDIRECTORY > HATCHED EGG´RS INC.
Our Product philosophy is simple. We believe that kid's rooms and spaces should be filled with fun, unique and colorful things. Thats why with Hatched Eggr's you can fill a whole room with original characters you will find nowhere else, and put them on products that are second to none. While choosing for yourself if it does look better in red...or green or lavender. Manufacturered entirely in the United States, all of our products incorporate sustainable practices (local,non-toxic, low imapact and minimal packaging). This includes FSC Certified wood with no formaldehyde to compostable wrap in our packaging, all in an effort to create fun and responsible products that customers will feel great about. The Melville Chair: A fun and simple toddler-sized wooden seat that flips over and becomes a table or with another flip becomes a chair again, fulfilling a toddler-style need to make every side of every structure into something useful. A sizeable seat for a toddler, they last up until at least age eight as seats for pulling up to the coffee table for an afternoon of coloring, or the conductor's perch on a toddler train. Customers can choose from a ridiculous amount of characters and colors to find the chair that is just right for them. 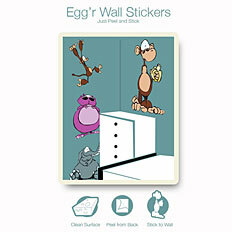 Egg'r Wall Stickers: A fun way to decorate a room! These one of a kind wall stickers go on easy and can be moved, and removed with no damage to the applied surface - even glass! Decorating a room is as easy as picking your favorite character and putting them on the wall. Lots of characters to choose from. Hatched Egg'rs will make parents and kids alike, giggle with the silly!